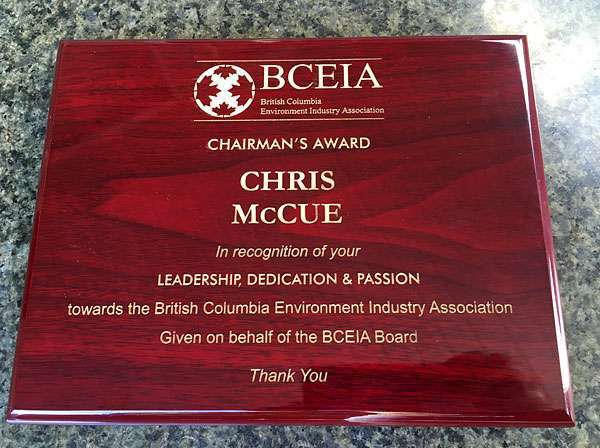 Chris McCue has served on the Board of the British Columbia Environment Industry Association since 2013. He started with the BCEIA as the Chair of a newly formed Communications Committee for which he spearheaded a number of initiatives including the photo contest, rebranding and new websites for both the Association and BEST Conference, and social media management. Chris received The Chairman’s Award in May 2017 in recognition of his leadership, dedication & passion towards the British Columbia Environment Industry Association. He now serves as the BCEIA’s 1st Vice President. 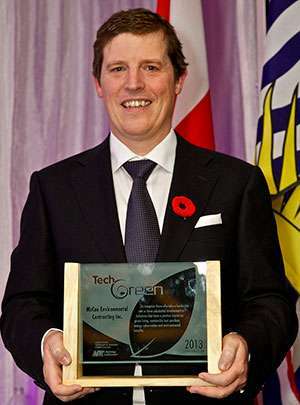 Chris McCue, president of McCue Engineering Contractors, was presented with the 2013 TechGREEN Award (Corporation) from the Applied Scientists, Technicians and Technologists of BC at an awards gala on November 2, 2013. The TechGREEN Award is granted to an ASTTBC member, corporation or organization contributing to a ‘green’ economy and sustainable society. It recognizes those who take a lead role or have a substantial involvement in initiatives that have a positive impact on green living, sustainable best practices, energy conservation and environmental benefit. McCue was recognized for delivering industry-leading technology in mine & industrial water treatment, and in situ remediation of contaminated land. McCue’s approach to contaminated land remediation involves the treatment of contaminated soil, soil vapour and groundwater in situ (in place) or the recovery of contaminated soil vapour, groundwater and free product for on site treatment ex situ (on the surface). Managing contaminated land in this manner is considered green remediation when compared to other remediation practices such as dig & dump. To further this effort, McCue has received three rounds of funding from the federal government’s Industrial Research Assistance Program for innovation in water treatment technology. 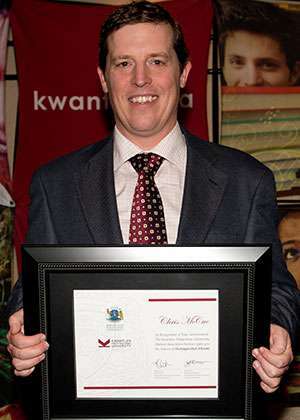 Chris McCue, president of McCue, is one of four Kwantlen Polytechnic University Alumni who received a Distinguished Alumni Award on October 24, 2013. The KPU Distinguished Alumni Award is a prestigious award presented to KPU Alumni who have enhanced the reputation of the University through their outstanding career, public and community service, athletic, arts and culture, or academic achievements. Kwantlen Polytechnic University Alumni Association (KPUAA) is proud of its more than 43,000 highly skilled and diversely educated alumni who every day make important contributions to industry and society. Our alumni have earned demanding credentials in everything from business administration to music and fine arts, nursing, fashion design, construction, liberal arts and journalism. They are accomplished, dynamic leaders that value innovation, creativity and social responsibility.